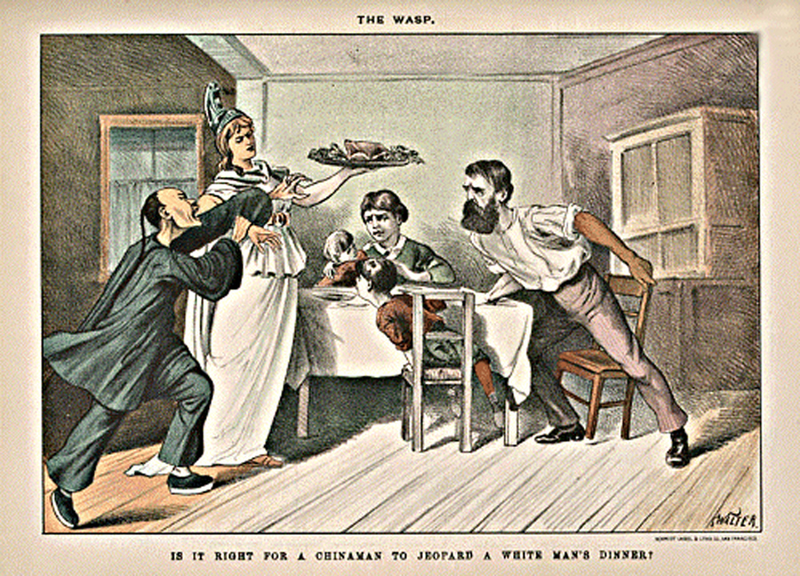 This cartoon, published in The Wasp in 1885, asked "Is It Right for a Chinaman to Jeopard a White Man's Dinner?" 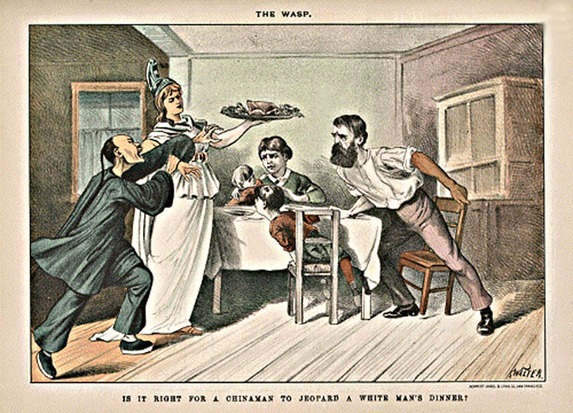 The Wasp was a weekly magazine of politics and satire with lavish color illustrations. It was among the most widely read magazines on the West Coast in the late 19th century. Its illustrations frequently featured racist caricatures of Chinese immigrants that fueled exclusionist sentiments. Is it Right for a Chinaman to Jeopard a White Man's Dinner? Source | K. Walter, "Is It Right for a Chinaman to Jeopard a White Man's Dinner? ", chromolithograph, [back cover], The Wasp, v. 15, July-December 1885, from The Bancroft Library, University of California, Calisphere, http://content.cdlib.org/ark:/13030/hb258001nq/. Cite This document | Unknown, “The Wasp Serves Up Anti-Chinese Prejudice,” HERB: Resources for Teachers, accessed April 22, 2019, https://herb.ashp.cuny.edu/items/show/653.